Welcome to our Green Costa Rica Yoga Resort and Spa. The Bodhi Tree Yoga Resort was creatively designed around nature, leaving the surrounding jungle as it was meant to be. We continuously strive to be as environmentally friendly as possible by preserving the jungle’s natural state, leaving the impression that Bodhi Tree Yoga Resort has been here for many years. Here at Bodhi Tree, we take water management very seriously. We make sure every drop of water is used efficiently and sparingly. We’ve built our own water treatment plant, so no water is wasted. The water from our treatment plant is used to irrigate the gardens, keeping our lush grounds green without draining subcutaneous water supplies. We utilize the sun with solar panels to heat all the hot water required for the resort. We are also very proud to be a plastic free facility. Through education and consistent effort, we’re working to make Bodhi Tree a consciously green and environmentally friendly resort. Say Hello to our Staff. Bodhi Tree Yoga Resort takes great pride in hiring locally. 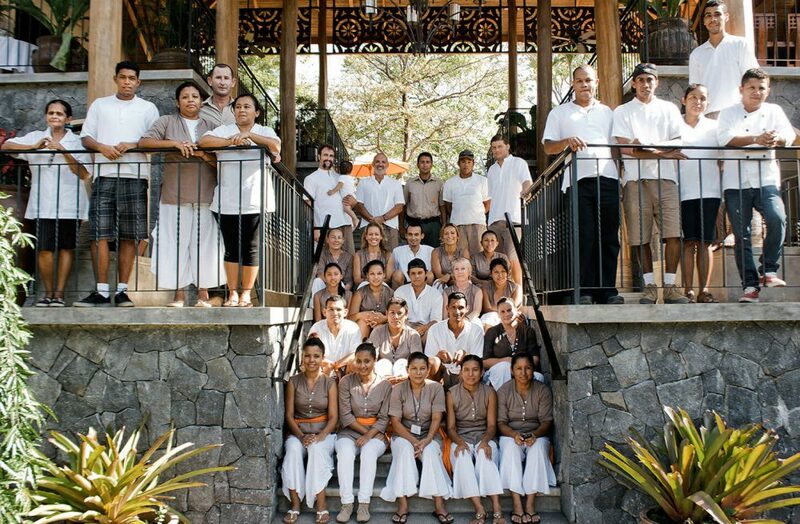 Our creative and progressive staff will give you a taste of the real Costa Rican culture. Keeping Costa Rica beautiful by supporting Coastal Restoration. Bodhi Tree Yoga Resort is a gold sponsor for Costas Verdes Organization. Costas Verdes is a non profit organization dedicated to coastal restoration. The goal is to reforest degraded beaches in Costa Rica through community involvement. They strive to empower local schools, businesses, and authorities so they can lead the process. The result is a positive impact in the ecological, social, and economical situation of the area. The No Plastic Nosara movement was started by a few members of the local Nosara community who were concerned about the amount of plastic waste generated in our beautiful town. They focus on reducing plastic in town through education, as well as raise consciousness among locals, tourists and businesses about the negative impact that single use plastic straws have on our marine life and the environment. In addition to education, they provide alternative options to plastic for businesses and consumers around town. Their goal is to serve as an example to other communities, so they too can find ways to be more conscious consumers by reducing, reusing and recycling. Join the movement and be part of the change. Founded in January of 1999, the Refuge for Wildlife has been a place for injured, displaced and orphaned wildlife from Nosara and the Nicoya Peninsula region of Costa Rica. While the Howler Monkeys compose the majority of the animals that pass through the Refuge, they are certainly not the only visitors. The refuge also receives squirrel monkeys, spider monkeys, capuchins, parrots, toucans, hawks, snakes, porcupines and bats and many more.